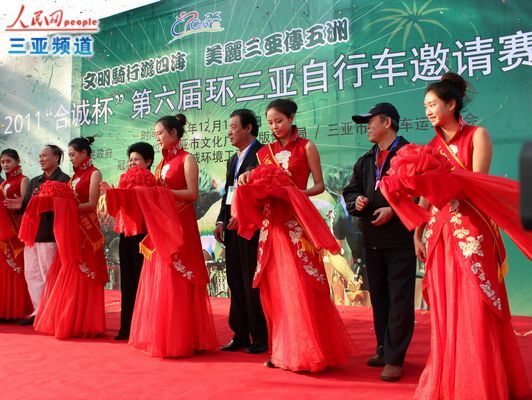 The 2011 Sanya Bicycle Race kicked off at Haiyue Square on December 17 as 150 cyclists launched into the road bike race at Luneng New City, Sanya Bay. The race, which attracted 20 teams from South Africa, Hong Kong and Taiwan, consisted of a road race and mountain biking race. The riders were ages 17 to 70. With the problems of air pollution and traffic jams becoming more serious, many cyclists advocate to leading a low-carbon life by using green transportation. As a contest annually held in Sanya since 2006, the bicycle race has grown a great deal in not only promoting the bicycle sport, but advocating the idea of low-carbon life in city development.